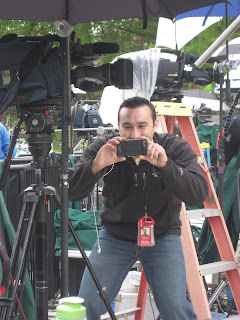 Like I said, I have been going NON-STOP (at work and home, but especially at home) since the night Osama bin Laden died. It was a crazy night, and one of the most memorable thus far in my career, so I wanted to document it. It was Sunday night. Michael and I were up later than we should have been for some reason, like 10:00pm. I got an email from the White House saying the President was going to be making a statement. I tried all of my sources, trying to figure out what was going on. All I was able to get ahead of time was that it was an "important national security update" and that I didn't wan't to miss it. Okay. So, I got the bed turned down, Michael took care of the dogs' evening walk, and I snuggled up with my laptop, eyes glued to our living room TV. And, I waited and waited and tweeted and tweeted. Moments before President Obama made the announcement from the White House, I read a tweet from a guy in Pakistan who inadvertently let the world know what was going on. From that moment, I was blogging, tweeting, emailing, calling in on a conference call, and sniffing around at a crazy pace! It was crazy exciting and fun. I heard reports of people, hundreds, gathered outside of the White House. I looked at Michael and sighed, "I wish I could go!" It was like 1:00am. In our house, we wake up at 4:00am on Monday to take care of bathroom stuff. There's a little wiggle room, but it's not an optional kind of thing, if you know what I mean. So, I did. I grabbed my backpack, my computer, my flip cam, and I rushed to DC. As soon as I got into town, I heard people yelling, honking horns, and cheering. 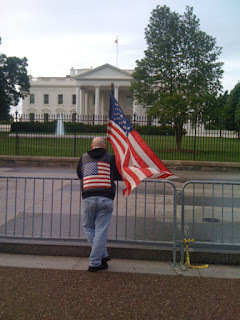 I made my way to the White House, and the scene outside the Northwest Gate was amazing. 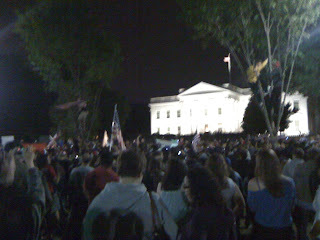 Thousands of people waving American flags, singing patriotic songs, and chanting things like, "Obama got Osama!" There were even patriotic dogs. And babies. It was really incredible. Poor Michael was at home, drifting off, supportive, but obviously, really sleepy. My plan to get a quick nap before going back to work was changed when we realized his catheter had come off. Great. So, we ended up taking care of all of the bathroom stuff. And, I didn't have time for a shower. I just brushed my hair, put on some makeup, and headed to the metro. It's the times like those, when my professional rocking-and-rolling bumps into the stuff I have to do at home, that brings out the worst of emotions in me. Major guilt alert!! And I know I was exhausted that morning. And mean. And I said things I shouldn't have and sighed loudly and grumped around more than was necessary. I hate it when I do that! The rest of the work day I was pumping with adrenalin. It was "total news crack," as I have described to you before. And, they brought me Starbucks! God bless America! 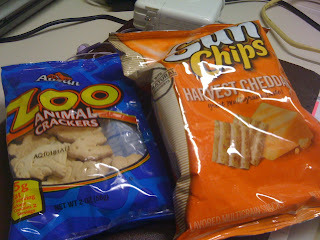 Which was good, because at that point, I was existing on vending machine food. Things at home, obviously got better. I apologized to M. Got some rest. And life goes on. It sure is hard to have it all. I know a lot of women deal with trying to find this balance. And men, too! So, if you have some ideas for me, please, chime in! Because that work/home balance definitely eludes me sometimes! Now, I don't mean to hijack your comment section here, but I thought you all might appreciate what he says about the White House...especially since you get to work there, Dana. And be a part of so much that happens in it's walls. 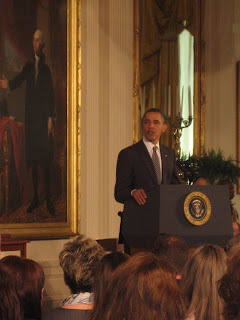 “There is an enduring vitality about the White House, and I feel it every time I go through the gate and up the drive. I always straighten up a bit, and my step quickens. Today, after 43 years of reporting and writing about the people and events in and around the White House, I have a little chunk of history tucked away in my memory. When I returned from Dallas during the dark night on Nov. 22, 1963, and wandered beneath the barren elms waiting for the return of John F Kennedy’s shattered body, about the only comfort lay in seeing that softly glowing façade and knowing it had seen such tragedy before. 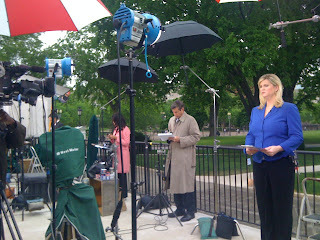 On that night, at least, the White House to me was a living thing.